Something different today, from the landscape out my door to the landscape of the produce section. I was struck by how the plastic bag gave the onion a sense of motion. WOW, Don! This is just wonderful! 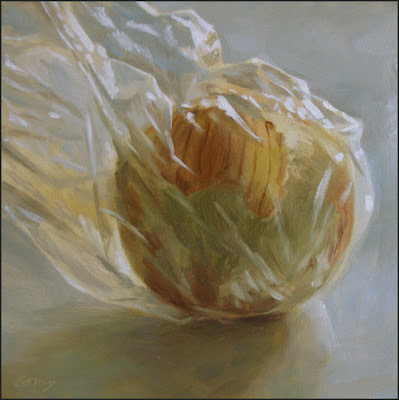 I love how the light in this painting bounces around with the onion, the plastic bag, the smooth surface of the table. Really, really nice. Hi Joanne, thanks a lot! Very nice! Reminds me a bit of Linda Lucas Hardy's colored pencil bags. You've done very well painting this plastic bag in oil. Love it! Don, I really like this new direction - very loose free luscious and dynamic! Do look at Janet Manyan's paintings - she is a fellow admirerer of the plastic bag. This is a beauty!! Stunning, absolutely amazing--and a wonderful example of how an arresting image, in the right hands, can be made of the most mundane subject! Thanks so much, Martha. Thanks for the link to Janet Manyan's work--I was not aware of her. Beautiful still lifes. Wish the reproductions were a little larger. You can tell it is fine work, but can't really get a sense of the surface. Thanks for visiting, Daniel, and for the comment. I'm enjoying your work a lot. Very kind words, Laura--thank you. Love the switch up Don. The bags really push you past the object and into the shapes, don't they? This and tomorrow's painting are very nice...! You're right, Jason. Somehow the bags are so ephemeral they don't "feel" like objects. It's almost more like painting an interpretation of flowing water. Thanks for the encouragement. I love onions.. and this one you painted in the bag is no exception. Your treatment of transparency is top shelf. Who thought the outer layer of an onion would be a plastic bag? Excellent Don. Bill, thanks for the kind words--means a lot coming from such an accomplished painter as yourself.